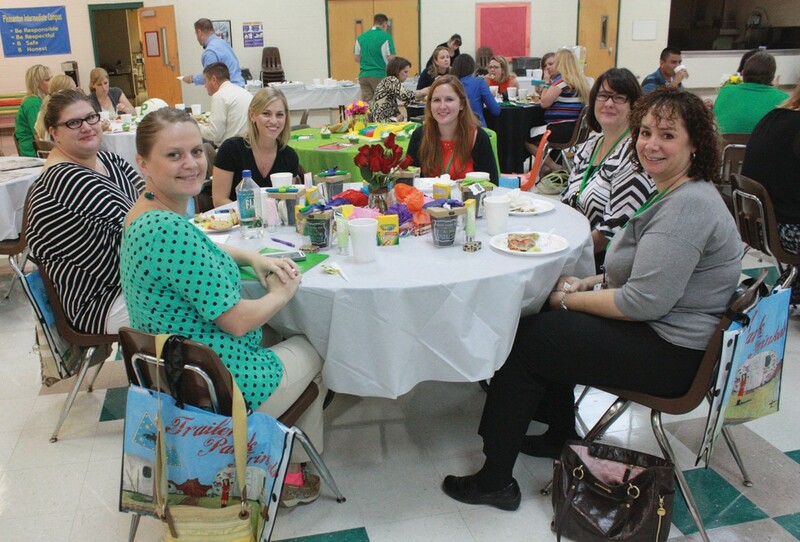 Local businesses decorated tables for the Pleasanton ISD new teacher luncheon held on August 14. Sitting at the Trailer Park Trinkets table are, left to right, Lorretta Janek, Katie Miller, Brandy Phair, Celeste Menasco- Davis, Heather Mosier, and Eileen Grose. Pleasanton ISD is excited to welcome 39 new teachers to the PISD family for the 2014-2015 school year. The new educators were greeted with well wishes and gifts on Thursday, August 14th at the annual New Teacher Luncheon. On their first official day as members of the Eagle team, the teachers were treated to lunch catered by Carrie’s and showered with gifts donated by local businesses. Retama Manor-North, Workplace Innovations, H&R Block, Carrie’s, Kaleidoscoops, Pleasanton Express, Cafe Chris, Paisley’s Boutique, State Bank, The Tradin’ Post, Bedazzled, South Trust Bank, Sissy’s Boutique, CAM Safety, Rexco Pharmacy, Dairy Queen, Atascosa-McMullen Retired Teachers, Nest Feathers, Prosperity Bank, Massage Therapy Center, and Ignite.